Fringes of His Ways: Progress! Well, I mentioned last time that we had made some progress on our mudroom project. It is true. A while back (as in several months ago) we actually hung two of the five carcases. For those who have never read the Time Life handyman series, specifically, the How-To-Build-Cupboards book, the carcase is the basic box that you put stuff into. Without the shelves or doors. I would say that they are quite a success. And I would know, since I have had several months to look at them as they collect things with which we don't know what to do otherwise. Perhaps I shouldn't be so hard on us. One carcase is actually holding its intended occupants: our china, which came out of long-term storage in the basement recently. Instead of packing it back up in newspaper, Jeff splurged for a whole set of storage bags for just this purpose. I have been wanting some for quite a long time, but when I actually look at them in the store, I think, "There are lots of other things that I could spend this $20 on right now. I'd better wait." Silly, I know. They come in handy! I often pack up a set of dishes to take somewhere for a party or dinner held somewhere other than my house (which, we've established, is not party-ready, especially in the winter). So it's nice to have a safe vessel in which to carry them. However, the china is not meant to be stored in them, ultimately. That would render worthless the glass doors that we will eventually attach to the carcases. As I wait, though, I have been sufficiently assured that the cupboards are well supported and strong as can be. My dishes will be safe when they reach their final resting place. 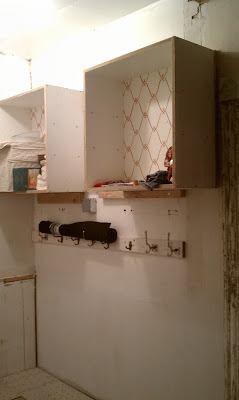 The cupboards are only a small part of the progress, though. Our next step on this wall unit will be the "locker" space where the kids can hang up coats, backpacks and snowpants, with a space for wet boots and shoes under each locker, and cubby space above for storage of small items, like notebooks and umbrellas. Since this part of the unit will stretch from the floor to the bottom of the cupboards, we needed to address the floor first. We have always liked the look of slate, and we especially like that it is textured, thereby providing some protection from slipping. 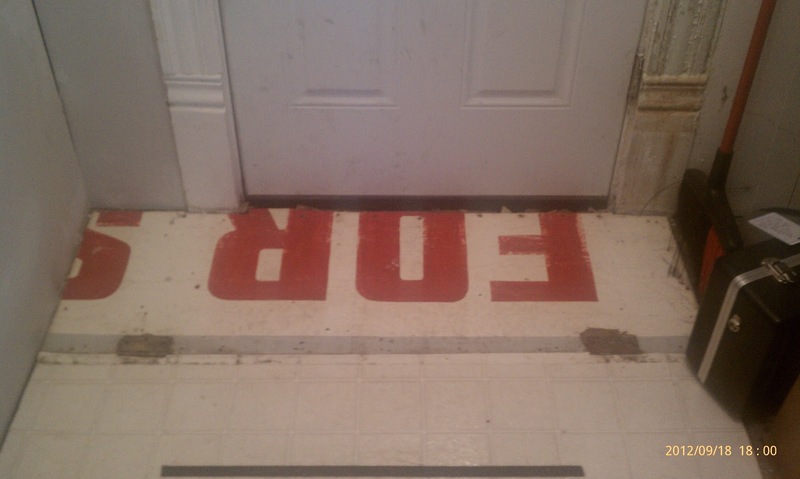 Since we track lots of snow and rain into the entryway, we decided that slate was the way to go. So in October, we bought the tiles. And there they sat. We had never laid tile before, see, so we were a bit lost as to what needed to be done. Well, we knew the steps, but there's always this mental wall that keeps us from taking the next step. Perhaps I am being too hard on us again. 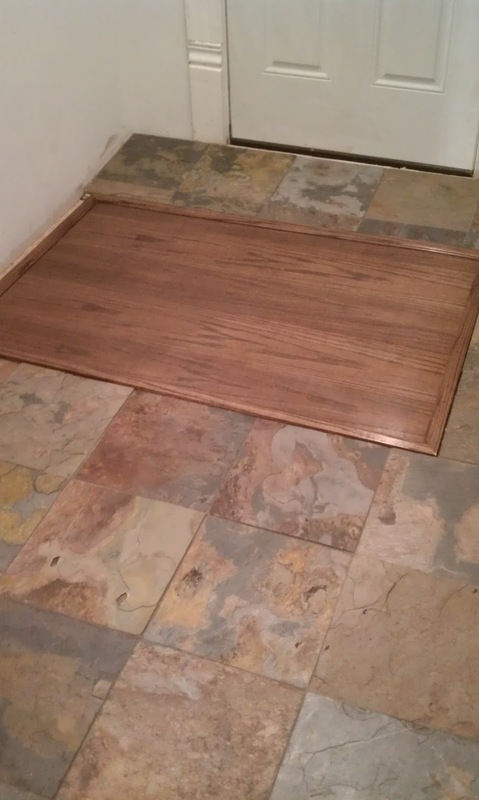 This is no ordinary floor, and this would be no basic tile job. 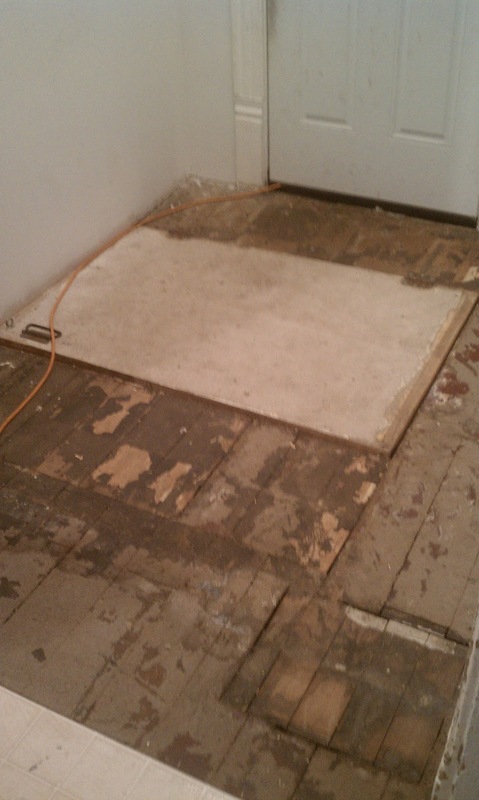 Unfortunately, I don't have a picture of the floor the way it used to be. I forgot to take the "before" picture. But here's the thing: there's a trap door in the middle of it. It's the only access to the basement. Up until we demo'd the room, there was an elaborate pulley system that spanned the wall, with old bleach jugs filled with sand acting as counterweights in the basement. All we had to do was pull the rope down, and the door would lift up, allowing us entry. Well, that brings up all kinds of issues. We couldn't put tile on the door. It would be far too heavy to lift, and the constant movement up and down probably wouldn't be good for the tile, anyway. 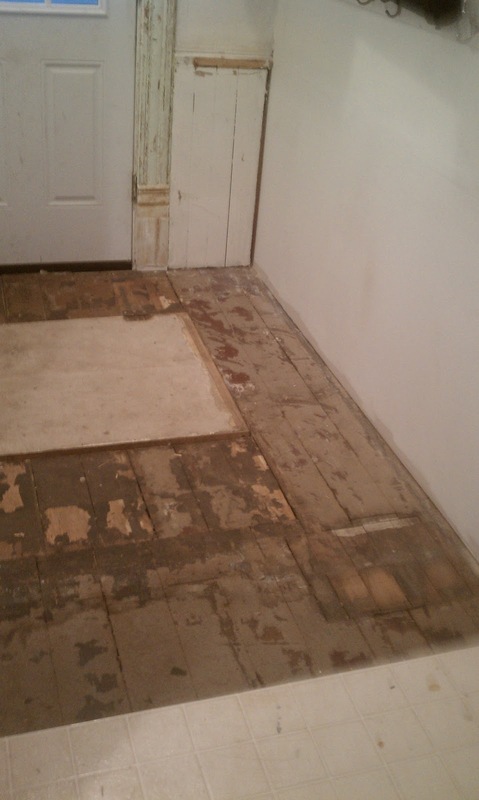 The whole floor used to be covered in linoleum. Nice and lightweight. But I hate linoleum. And I wanted slate. So we decided that we would just get a large rug and attach it to the door to cover up the fact that there is no tile there. One problem solved. However, there were a couple of other issues. For one thing, the space between the exterior door and the basement trap door takes a rather steep dive. It is highest by the exterior door, and I would say that it drops toward the basement door a good inch. We were a little unsure about how to deal with that. And finally, while we intend to continue the slate into the kitchen, we are unable to do the entire floor right now. The footprint of the kitchen will change when we get around to renovating it, so it would be silly to lay the floor now. 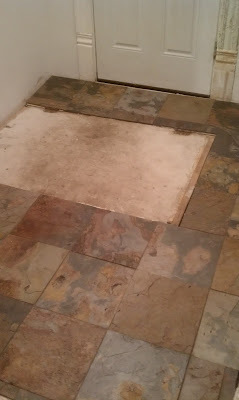 So what could be do to avoid having a big gap where slate meets linoleum? So with all these weird little issues, we managed to find other things to keep us too busy to get to the floor job. Finally, after Christmas, we had had quite enough. So we got to work. These are actually pictures from a while back. 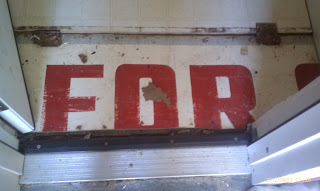 We removed the linoleum some time ago, and look what we found! 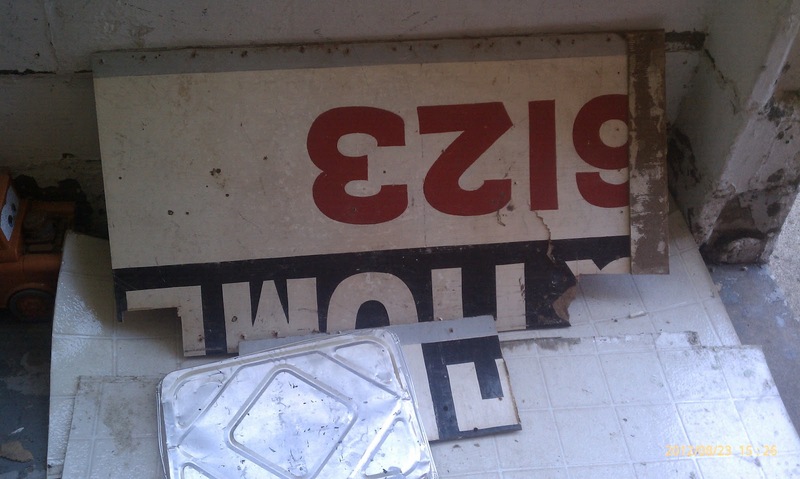 An old For Sale sign had been repurposed as a sub-floor. This may be the time to pull out a Dutch joke (West Michigan has a very high Dutch population), but I feel a little funny, not being Dutch myself. 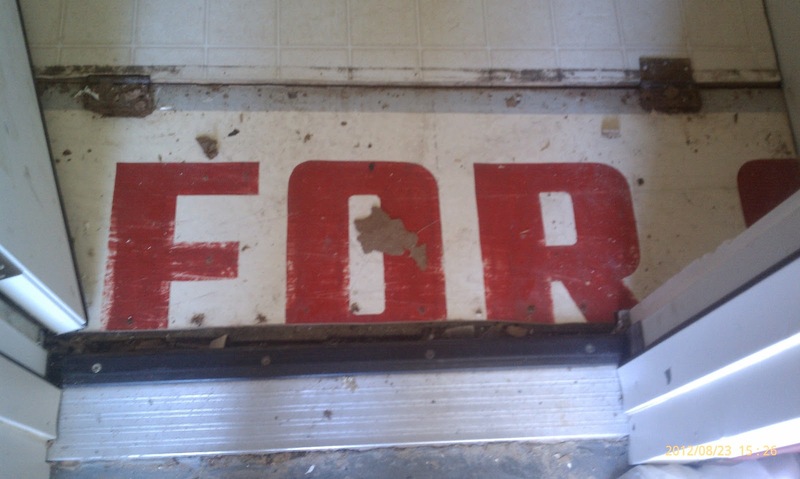 After we pulled up all the pieces of the For Sale subfloor, we were left with this. Jeff had a heck of a time getting those hinges out. The lockers will go along this wall, and we debated whether to tile all the way under the bench, since it won't be seen unless you get on your hands and knees. Here is the first step after our long winter break from the project. Jeff had already laid the new sub-floor, and then we put down the cement backer board. 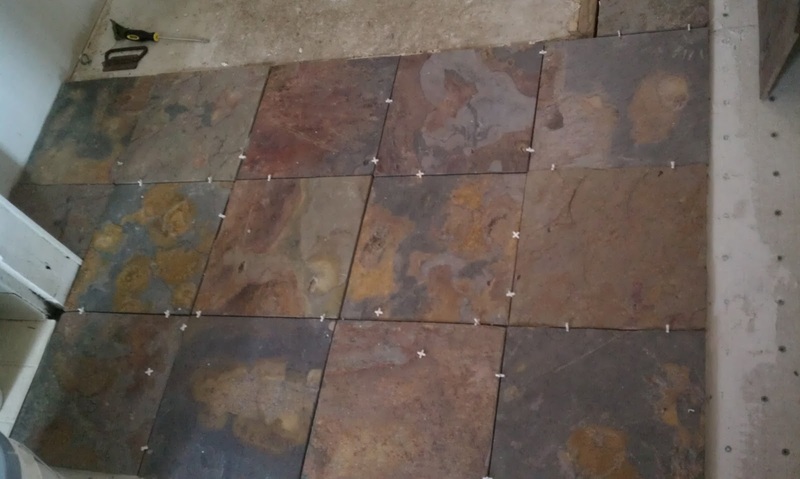 We put twice as many screws in as it said to use, because of the wonkiness of the floor. We didn't want it moving at all. It doesn't get much more solid than this. 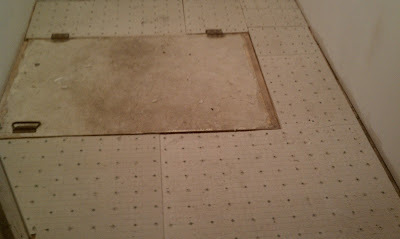 And finally, we got up the nerve to actually lay the tile. Turns out, this was a worst case scenario tile job. I'll be honest. We got the cheap stuff. We looked at the tile specialty stores, and the slate was beautiful. And it was $5.99 per square foot. Then we looked at the slate at Lowes. It didn't look that much different. And it was $1.48 per square foot. Easy decision, right? I knew, in the back of my head, that there was a very good reason that the Lowes tile was so much cheaper. I just shut that voice down and pretended I had never heard it. These tiles, while beautiful, have a great tendency to flake. I read somewhere online that slate is one of the hardest stones available for flooring, but there are differing degrees of hardness, and you have to blast through the "softer" stuff to get to the harder stuff. They used to discard the softer slate. Now they sell it to big box stores.....like Lowes. That would explain the flaking. The other problem was that the thickness of each tile was significantly different. They could vary by nearly 1/2 an inch. While that came in handy when we needed to fish out the thinnest possible tiles to put under where the door would swing open, it did make for a difficult, and only partially successful installation. I definitely made some mistakes here. There is one tile that is literally surrounded on all sides by thicker, thus higher tiles. And there are a couple of spots that simply have too great of a difference in height between two adjacent tiles. But it's not enough to stub a toe on. And since I have vowed to approach all house projects with the attitude that nothing is perfect in old houses, so I might as well make the new things fit in, I am okay with this. I consider it to be a learning experience, and when we branch out to the rest of the kitchen, I will be more diligent to use a thicker coat of thinset under the thinner tiles, and try to make height differences more gradual, rather than putting two tiles that are vastly different thicknesses right next to each other. I mostly placed the tiles by color, rather than thickness. Next time I will try to find a balance between the two. The good news is that, when we get around to renovating the bathroom, the ceramic tile that I put up will be a breeze! Every tile is identical! So anyway, it was slightly difficult as tile jobs go, but in the overall scheme of things, it was easy! 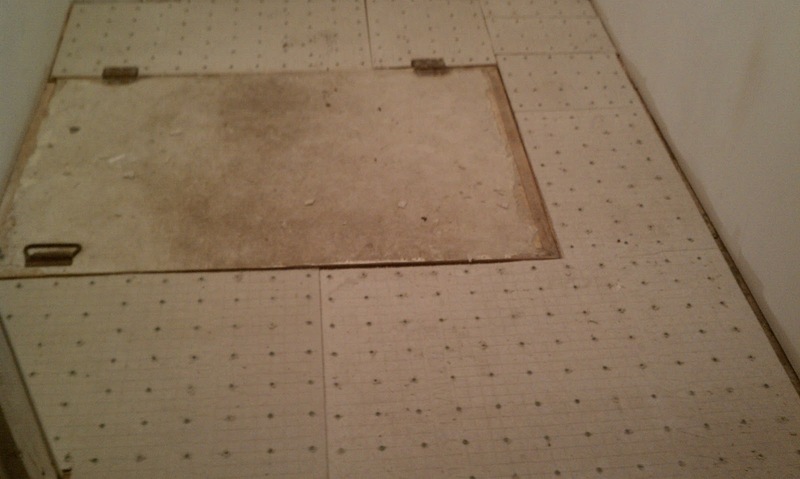 I am not afraid of laying tile at all now. Two weeks later, I finally got up the nerve to seal the tile. I had been quite afraid of messing it all up. Turns out, this job couldn't be much easier. Think polishing a table--not applying polyurethane to it. You just wipe the stuff on, and it dries, and you find out that your tile is even prettier than before! Buoyed by this victory, I moved right on to grouting. Again, I was afraid of mixing it wrong, but it seems that even mixing isn't too hard. I applied the grout, and Jeff came behind me to wipe up the excess. Easy peasy. Finally, we had to address the trap door. I was never really pleased with the idea of the mat. The only ones big enough to cover the door are those industrial black rubber or commercial black fuzzy things, like you see just inside of a school door. Yuck. I can't remember how I thought of it, but I suggested wood to Jeff. I'm pretty sure I was just thinking about using a thick trim around the edges of the door to facilitate using a nicer rug. But Jeff said that we could get 1/4" oak veneer plywood, which is not heavy at all. So that's what we did! I like it a lot. Would I prefer not having a door in the middle of the slate floor? Yes. But given what we had to work with, I think it turned out really well. The pictures don't even do it justice. The colors are much deeper than they look here. I absolutely love it.